Come and relax in our traditionally furnished croft house on North Uist. 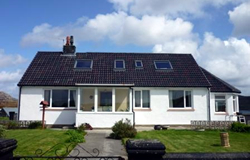 Harbour View Bed and Breakfast/self catering is situated on the Island of Grimsay, North Uist. Overlooking Kallin Harbour our location is ideal for viewing wild life such as the resident seal population, otters and red deer. The harbour offers boat trips as well as freshly caught shellfish, which is not to be missed. Grimsay is an ideal location for hill walking, fishing or simply relaxing as its situated between North and South Uist. Harbour View offers outstanding scenery and a warm welcome.